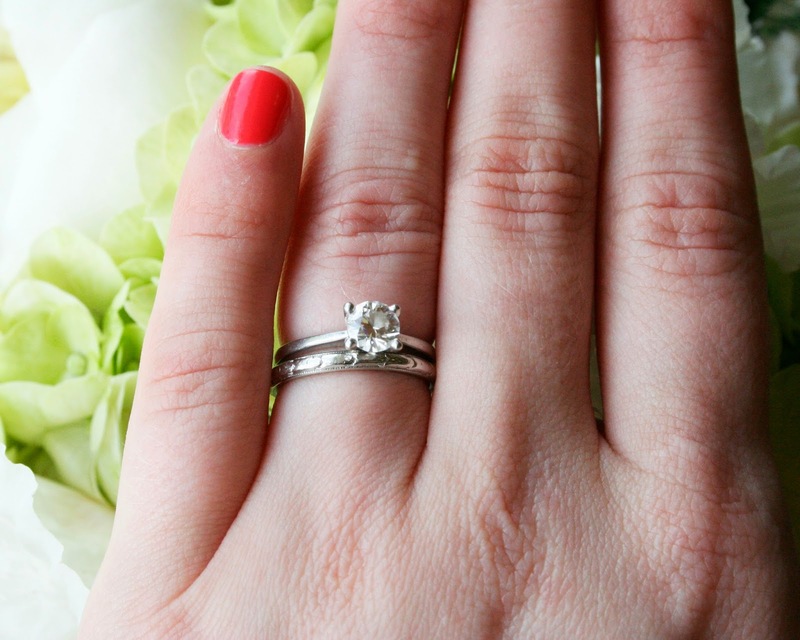 Hi everyone, it's Grace from Heart Deco again, here to talk about wearing your vintage wedding and engagement rings. 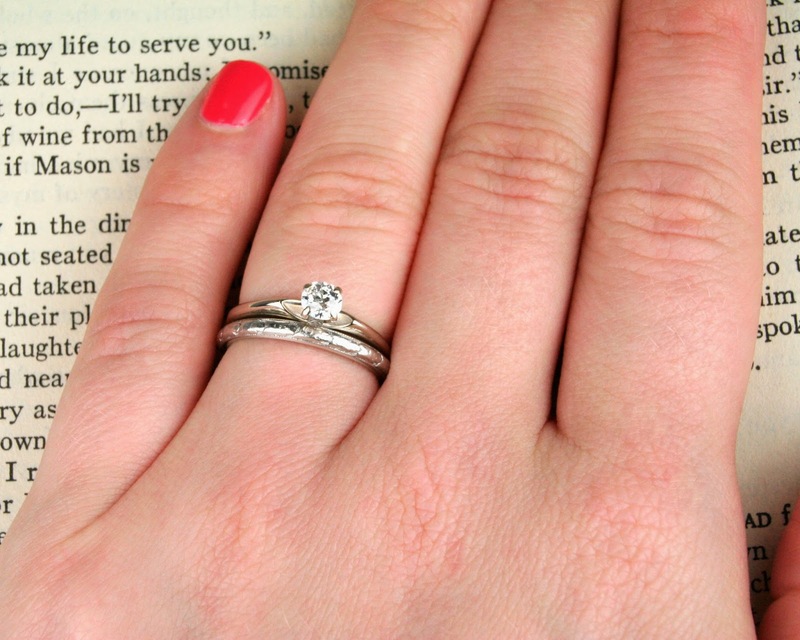 I've talked to a number of women who found that finding a wedding band to pair with their engagement ring was more difficult than they imagined. The good news is that the only real rule when it comes to picking out your engagement & wedding rings, is that you love them! Mixing styles, eras, or metals - it's all good! A simple solitaire ring with a setting that makes it easy for a wedding band to sit nice and close is probably the easiest to work with, whether it's vintage or contemporary. I've sold a number of vintage bands to brides with modern engagement rings, and I personally love the look. It's a great way to add something unique with a bit of history. Vintage engraved or patterned bands are particularly special, and are perfect for when you don't/can't wear your engagement ring, but want something more than a plain band on your finger. c1930's platinum engraved blossom band with a modern platinum solitaire. Here's another example that I love. This time with a mix of styles, metals, and eras. If your style is more eclectic, a combination like this is a fun option. If you don't like to mix metals, try something like this with both rings in the same material. 1) Embrace the fact they won't "fit" closely, and wear it with a band anyways. There'll be a gap, but that doesn't necessarily mean it can't work. In fact many vintage rings weren't designed to be a perfect match, and even those that were, were often worn with some space between them. 2) Find a local jeweller who does custom work and have them make a band that pairs perfectly with your ring. It might mean that you won't want to wear the band alone (if it's an unusual shape), but is a great option if you want a perfect match, but also have an engagement ring with a less "traditional" design. 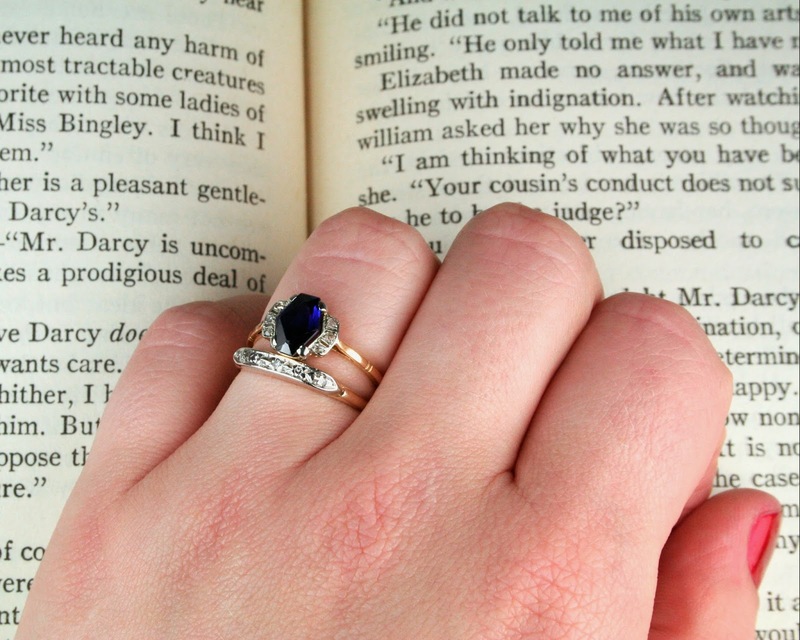 3) Wear your rings on different hands. 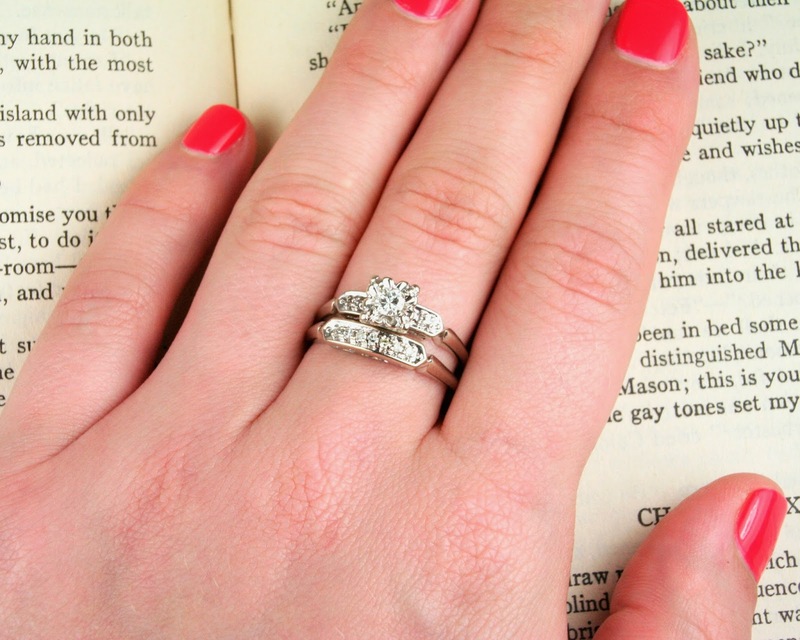 If you have an engagement ring that is a real statement piece, let it shine! 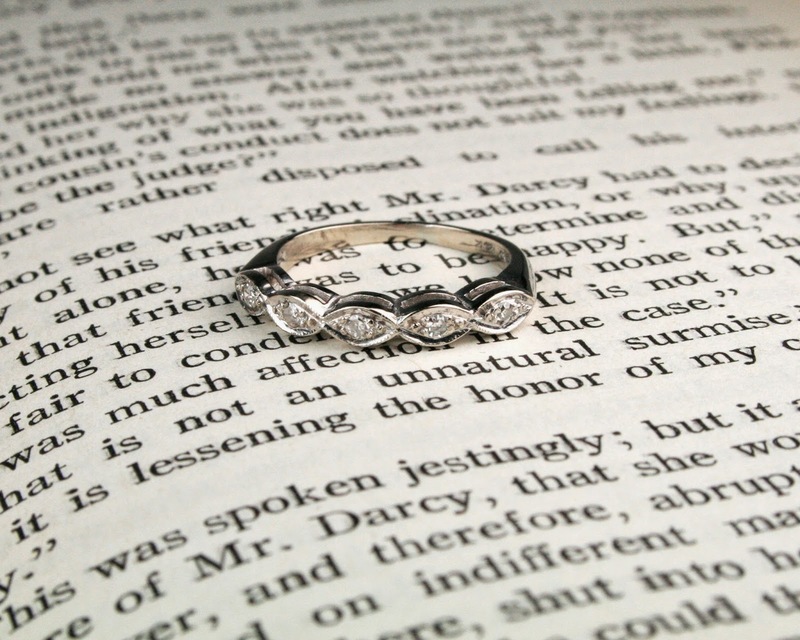 Wear it on your left hand until you're married, and then move it to your right hand. This allows you to wear each ring solo, and your wedding band could be something in a similar style/material as your engagement ring, or something totally different! Sapphire & diamond ring with a wedding band, both in two-tone yellow gold with white gold settings. This pair is a classic Retro/Mid-Century bridal set. You can see the rings are a perfect match, and the front panels line up closely, but there is still a gap between the bands, which is common for these rings. 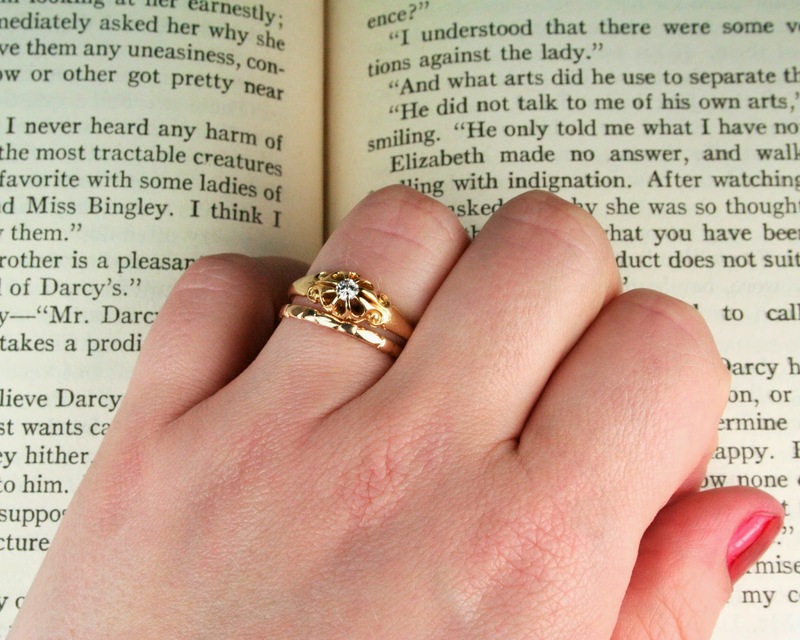 If you can't find a band that fits perfectly with your engagement ring, but like the stacked look, try looking for a band with some movement in it, rather than a simple band, like the yellow gold rings pictured earlier, or the scalloped ring below. The fluid lines will help fill in the gaps between the rings. Just remember, there's no "right" choice. Feel free to experiment, and if you're stuck, try on anything and everything until you find something that works for you.